New popular tactical gear is available at Airsoft Atlanta this busy Christmas season. Newly designed child sized tactical vests are big hit with parents this year, for both outdoor sports, and tactical milsim play. Airsoft Atlanta has many new outdoor products for sale this year, both online, and at their store front just outside of Atlanta. Sales of new tactical gear have been doing great so far, with many original designs and patterns available to customers worldwide. Tactical gear consists of products used for airsoft play, milsim (military simulation), outdoor sports, and hunting activities. Child sized tactical vests from NCstar have recently been beloved by both parents and kids alike. The $33.99 vest comes in three different colors, equipped with a built-in pistol holster, and offers many pouches and strap adjustments to fit most junior sizes. "The kid vests have been selling like crazy at our store! They've been the biggest surprise seller this Christmas season," states Steve, a sales associate with Airsoft Atlanta. "They've actually been outselling the adult sized vests recently." Blackhawk is another manufacturer of cutting-edge tactical equipment that is doing well this holiday season. The SERPA holsters are made of a fantastic plastic material, built for durability and fit on the field. These primary holsters can be used with Glock, 1911, Beretta, and many other major brands of handguns. Blackhawk tactical gear is popular with both airsoft players, police officers, and military personnel. Lastly, another trendy gear manufacturer making waves this season is Condor Outdoors. Condor has been producing some of the best valued tactical gear in the US for the past few years now. Their high quality Cordura fabric is used in the vast majority of their products, which is a step up from the cheaper PVC nylon materials others use. Popular tactical gear from Condor consists of crossdraw vests, gun rifle bags, holsters, slings, safety equipment, magazine pouches, and duty backpacks. 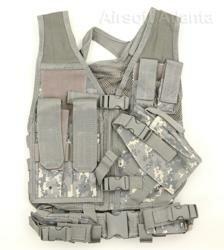 Airsoft Atlanta is one of the oldest authorized retailers for Condor tactical gear in the USA.